Another white interior…however, this white apartment in Barcelona is very different from this beautifully styled 20 sqm2 flat in Sweden. Or this other white apartment with natural accents I showed you a few weeks ago. Let’s start with the kitchen which was the room that first caught my eye. 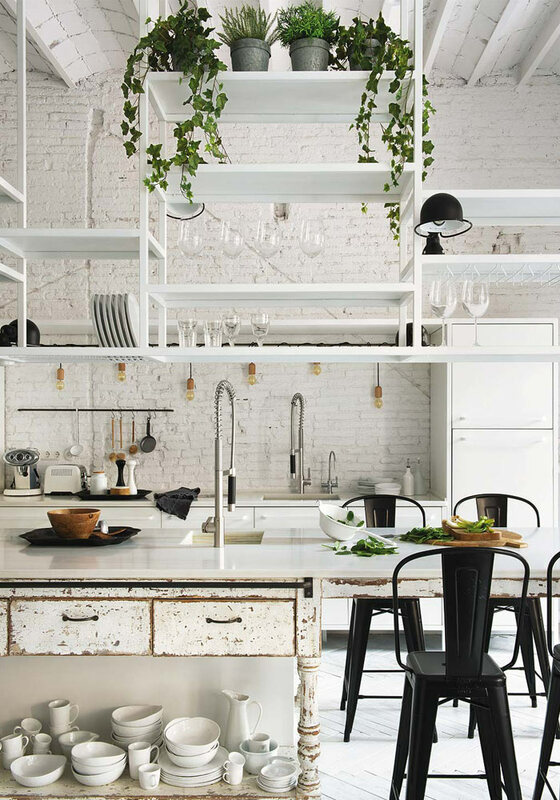 The kitchen, filled with natural light, manages to combine several styles I like at once: Scandinavian, industrial, contemporary and vintage. Yet everything is beautifully done with a great aesthetic and strong personality. The black Jieldé black lamp and Tolix chairs bring a stylish, industrial touch to the room. Similar white crockery and chopping boards can be found at The White Company. In fact, these heart-shaped oven dish and heart-shaped ramekins are great to serve pudding. However, my favourite collection remains the handmade artisan stoneware plates which have a timeless appeal so you can use them all year long. Do you have a kitchen with two sinks? However, a spacious workstation is important and I’m currently making some amendments to our kitchen counter in France to achieve this. First, I’m in awe with this floating shelving which was tailor-made. I really like how Designer Marta Castilian-Mas, customised a vintage piece of furniture to create a sleek, practical kitchen worktop. Secondly, the herringbone flooring painted in white looks superb and adds a unique feature to the room, don’t you think!? The dining and lounge areas, with their high ceilings, are not bad either. The different models of white chairs around the dining table are from HAY. A similar look can be achieved with vintage chairs sourced on eBay or in second-hand shops as I did for our dining room in our holiday home. French Connection Home used to have a similar coffee table but I can no longer find it in their collection. However, their current collection includes other gorgeous models like this marble coffee table or this striking metal coffee table. Bathrooms with a view always add a wow factor to a home and having the bathtub in the bedroom will also add a sense of luxury. 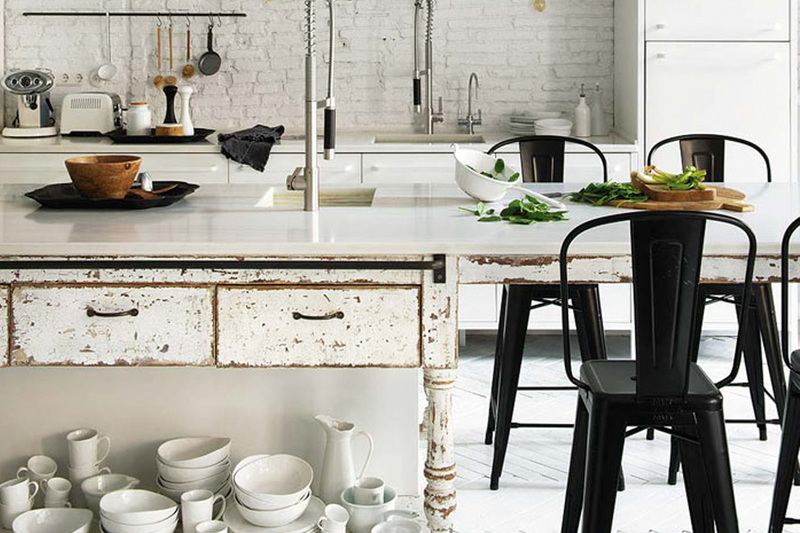 If you need more kitchen inspiration, please check my previous blog posts or my Pinterest board. 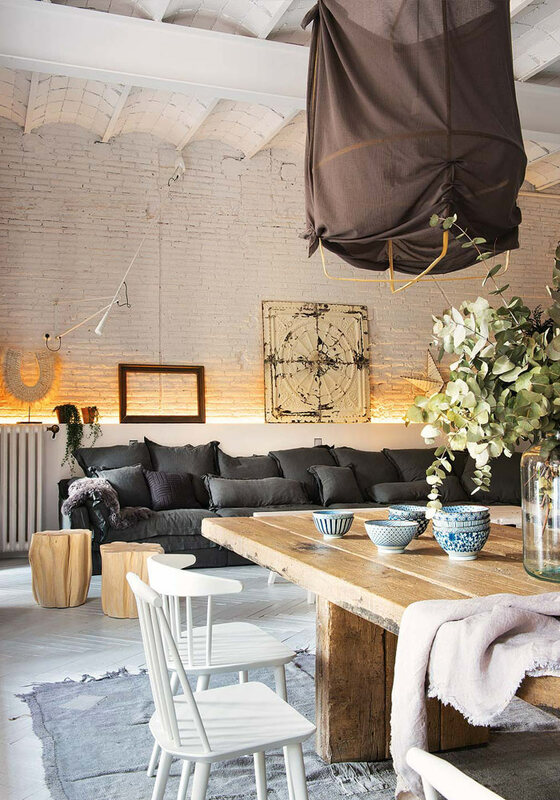 You can see more pictures of this beautiful flat in Estilo magazine. Absolutely gorgeous! I especially loved the natural tree trunk tables since we just made one ourselves from some foraged live oak. I agree, the blend of these different styles works wonderfully in this home. Very inspiring, thank you! Really excellent post, I certainly adore this site, keep on it. I loved the way you have incorporated the kitchen and the dinning table together. The kitchen floor tiles are also pretty nice and so is the vintage dinning table look. Loved the interiors… Great writing..
this is absolutely STUNNING!!! that kitchen was worth it – it’s perfect!! sooo darling! WOW! The space is amazing. 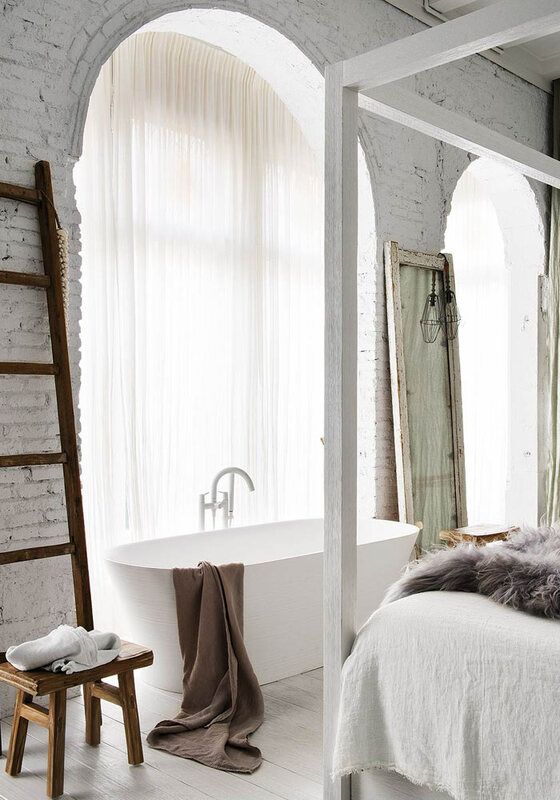 I love the all-white raw brick walls, make the minimal colours in the rooms pop out. bookmarkеd! !, I really like your blօg! This is great! It is such a lovely article and I find that the photos are lovely as well. It’s just amazing how you put all these together on [topic] with such great tips! Looking forward to more of these.